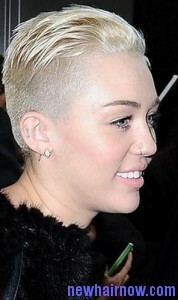 Miley Cyrus with cropped haircut can be a perfect hairstyle for both men as well as women. Even kids can cut their hair in this way to get different types of look. It is very simple to get this hairstyle achieved at home than going to the hairstylist. You can simply use the clippers to get this style done at home and put only little amount of pressure with this tool while using it over the head. Make sure not to use the tool for a long time on the head as it can damage it. First take clippers with attached clipper guard number 8 and use it over the head. You can use the clipper over your head the as per your desire. Then comb the hair that is long and use the clipper near the ear on both the sides of your head. Now you must texturize your hair ends with the help of thinning shears and brush the entire hair away from the head. You must move your hair shaft just half inch by closing your thinning shears over the hair once again. This will texturize the ends of your hair and maintain an uneven hairline at the ends of your hair. Keeping the hair ends uneven is the best way to achieve this hairstyle. At last brush your hair once again and maintain the hairstyle naturally without touching your hairline. Messy cropped hairstyle is a perfect choice for both men as well as women. 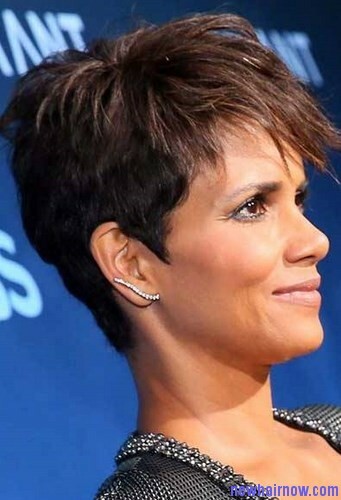 The normal cropped hairstyle is very popular among most of the people all over the world and it can be made a little unique by creating it messy. Make sure that your hair has been properly cut by going to a hair stylist. After getting the cropped haircut, go through the hair and if it looks wavy or curly apply a hair straightening shampoo while getting a hair wash.
First dampen the hair using normal water and apply hair gel from root to end. Then bend your head down for drying the hair with a blow dryer. Take a small section of your hair using your fingers to style it a little messy. Now use a wax all over the hair at the end of your hair and try to pull out few hair strands from its original place or you can also try to twist them in one direction to make it look more unique than messy. Use this simple method on the remaining hair parts and at last mist the entire hair sections with aerosol spray. Try to use the spray by keeping the bottle away from the head which will prevent the spray from making the hair look moisturized. Don’t mist the hair with the hairspray by keeping the bottle close to your head as it can make the hair become a little bit frizzy.